A wind-damaged roof can leave your home exposed to the elements. Tarping is a critical to protecting your home from further damage. Whether it's a hurricane, flood or heavy rain or winds, LRE Construction Services, LLC's storm damage restoration experts can provide help fast. We have the expertise and resources to handle any size job. We're a local company so we're always ready to respond to storm and flooding conditions in Florida. When unexpected weather leaves behind damage to your home or property, our company is here to provide immediate help to secure your property and prevent further damage. If you need immediate help, call us at 1-855-300-3607. We have emergency response crews ready 24/7 in Tampa, Saint Petersburg, Clearwater and nearby. Emergency board up - Boarding up your windows and doors can help keep out unwanted intruders and prevent further damage to your property before the restoration work begins. 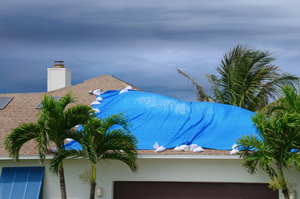 Temporary roof covering - If your roof has suffered storm damage from fallen tree branches, hail or wind, temporarily covering the roof with a tarp can help protect your property and belongings until your roof can be repaired. Wind damage repair - Strong winds due to a thunderstorm or hurricane can cause severe damage to your home. Whether you have a roof leak, missing shingles or damaged siding, we can handle all wind damage repairs to restore your home to its pre-storm condition. Water damage repair - After a hurricane or flood, we can provide complete water damage restoration, including water removal, drying, dehumidification and mold remediation. We also have specialized training and equipment to quickly and safely cleanup sewage. Reconstruction - Storm damage caused by a powerful hurricane can be so severe that the property might be damaged beyond repair. In situations like these, specialized skills are required to successfully restore the property. We take care to match building materials, design and finishes to the rest of the structure. Insurance claim assistance - Wind and storm damage is usually covered under insurance. If you're planning on filing a claim, LRE Construction Services, LLC can help you through the claims process and complete all storm damage repairs and restoration work. If your home has experienced damage from a storm, call the experts at LRE Construction Services, LLC at 1-855-300-3607. Regardless of the type of storm, our specialists can handle any size disaster. From boarding up your windows to drying your property, we're available around the clock. As an experienced disaster restoration contractor in Central Florida, we have helped hundreds of homeowners restore their storm-damaged homes, and you can count on us to help you too. LRE Construction Services, LLC can also retrofit your home or business with storm and hurricane shutters and impact-resistant glass windows and doors. Taking protective measures now can help prevent damage and save you thousands of dollars when the next storm strikes.